Humpback whales are now migrating to Okinawan waters, an annual affair for the big, slow beasts, and opportunities are available to watch them play and frolic. The most popular places to view the whales is in the Kerama Islands, near Naha. Tours are the simplest way to join Mother Nature as her ocean species show off for you. Marine Corps Community Services Tours Plus is running weekly tours through March. Officials say the tours are command-approved, and are continuing despite the military lockdown and Period of Reflection. Some tours are also being scheduled for Sundays. Tours Plus whale watching tours depart at 8 a.m., returning about 3 p.m. The $60 adult fee includes lunch and a shopping tour at Naha San-A Main Place on the way back. Children 5~11 travel for $41. H.I.S. 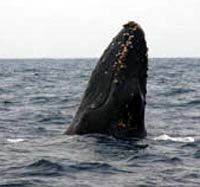 travel will operate daily morning and afternoon whale watching tours from Naha Miegusuku Port, next to the Loisir Hotel. Cost of the tours, which include only the boat ride, are $33 for adults and children 12 and older, $23 for children 4~11, and $5 for kids three and younger. The tours will run through April 6th. The local travel company H.I.S. will also operate weekend and Japanese holiday whale watching tours from Chatan Hamagawa Fishing Port. Cost is $38 for adults and $28 for kids. H.I.S. operates offices outside Kadena Air Base Gate 2, (098) 983-4620, and Hamby, (098) 982-7600. The Zamami Whale Watching Society is also responsible for dozens of tours now through March, the peak whale watching season. 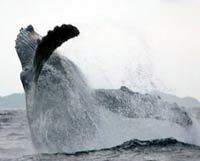 The entire season is being billed the Zamami Village Whale Watching Festival. Dive Shops and travel agencies in Zamami, Tokashiki and Naha all have tour programs throughout the coming weeks. Getting to Zamami, one of the largest of 20 islands in the Kerama Island Group, is easy from Naha’s Tomari Port. The cruises take 1-2 hours, and leave Tomari 2-3 times each day. Call 868-4567 for reservations and information. Other ferries ply the route from Naha’s Tomari Port to Tokashiki Island. From there, local cruises venture into the whale watching areas. Another option is to fly from Naha Domestic Airport to Kerama Airport on Fukaji Island, then pick up a boat for the tour. Several RAC flights make the run daily, each taking about 15 minutes. The choice of watching for whales from a moving boat, or from the Whale Conservatory in Unazati on Zamami Island, is yours. It’s from the Conservatory there that the whales are spotted by Society members, and the location relayed to the ships. For those with an equilibrium situation, it’s a recommendation. Another ashore site on Tokashiki Island is the Okinawa National Youth Center atop Mt. Akama. The Center offers not only the view, but inexpensive accommodations and more. The Kerama Islands are 25 miles west of Naha. The area was once a popular whale fishing ground, but became overfished. There are now 35,000~45,000 humpbacks, about 1/3 of the previous population. Humpback whales are part of a family of species including the blue whale, fin, minke, sei and Bryde’s whales. Black, with a mottled black and white underbelly, the humpbacks grow to lengths up to 52’ (16 meters). They feed on fish and krill, a shrimp-like crustacean, gulping down 1~1½ tons of food a day. The whales are active and energetic, enjoying splashing and doing flips in the water. They are unique, with dorsal fins on their backs and ventral plaits running from the tip of the lower jaw back to the belly. Scientists explain that the color and shape of those fins and plaits, as well as the uniqueness of the tail fin, are as individual as fingerprints from whale to whale. No two are alike. 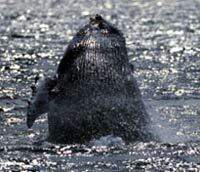 Humpback whales sexually mature in the six-10 year age range. Females calve once every 2-3 years, with gestation taking 12 months. The birthing ground is the Kerama Islands, which brings back the reasons for the whale watching tours.